It's been a rough few months for Pirate Bay co-founder Gottrid Svartholm. After being plucked from his home in Cambodia, dragged back to Sweden and held in solitary, he's now being detained in a regular prison. The good news is that he's a strong guy and coping well. Today he sends his personal thanks to everyone who has taken the time to support him through his ongoing ordeal. 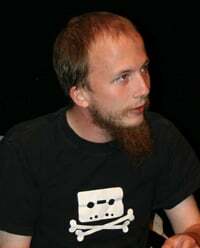 Pirate Bay co-founder is one of the most recognizable characters in the whole file-sharing landscape. His distinctive looks, undoubted abilities and recent history are a potent mix. While he has never sought fame, fame has found him due to his Pirate Bay activities (not least his responses to copyright holders) and earlier connections to one of the world’s most controversial webhosts, PRQ. Soon Gottfrid will gain even more exposure when his dry wit and delightfully eccentric traits are laid bare in TPB AFK, a movie which will only gain him even more fans. However, unlike his supporters Gottfrid will not be able to enjoy the release of the movie. He’s currently being held in Mariefred prison roughly 65 km outside Stockholm and it is highly unlikely he’s going to be able to download it from The Pirate Bay in there. Gottfrid is staying strong though and today he wants to show his appreciation to everyone who has been doing their bit to make his detention a little more bearable. He can’t do it in person of course, so the message comes through his mother Kristina Svartholm. “Gottfrid has asked me to send his thanks to all people that have sent him letters, postcards, gifts and so on to the prison where he has been staying since just before Christmas,” Kristina told TorrentFreak. Of course Gottrid is unable to thank every supporter personally for the cards, letters and gifts, but hopes that sending his message through proxies will do the trick. In fact, that seems like the most appropriate way of doing it considering his background. “Gottfrid says that he has covered the walls in his cell with pictures and postcards from all over the world. He has heaps of letters in there as well, together with books and other gifts that people have sent him,” Kristina reveals. And when Kristina says “heaps” she’s not exaggerating. “Some days the prison guards have brought him more than a hundred cards and letters, while sighing a bit over this extra work task of theirs,” she adds. But while the messages are getting through, the kindness of some of Gottfrid’s supporters has been held back by a prison system that dictates what he can and cannot receive. As revealed earlier this week Gottfrid may soon face additional hacking charges but in the meantime and aside from having little to do, he is doing fine. “He is treated well by both his fellows in there and people working as guards and he is fine in all respects – except for being a bit bored,” Kristina says. “That is all of you!! !” Kristina concludes.